The Austrian-American free market economist Ludwig von Mises (1881-1973) left Switzerland for the United States in August 1940. During the war years he wrote a number of books which criticised government intervention and control of the economy, especially price controls, rationing, policies of economic autarchy, the diversion of labor and other resources to war production, and the financing of the war through loans, confiscation, and inflation. Among these are Interventionism: An Economic Analysiss (1940), Omnipotent Government:The Rise of the Total State and Total War (1944), and Bureaucracy (1944). While Mises was living and working in the U.S. he would have seen the propaganda produced by the American government encouraging U.S. citizens to make sacrifices for the war effort, such as the use of "ration books" and price controls in order to allocate resources away from consumers and towards war industries, to seek work in "essential" war industries and the transport of munitions, and to forgo the use of certain products essential to the war effort such as fats and rubber. We reproduce some of these images here. This book is the property of the United States Government. It is unlawful to sell it to any other person, or to use it or permit anyone else to use it, except to obtain rationed goods in accordance with regulations of the Office of Price Administration. 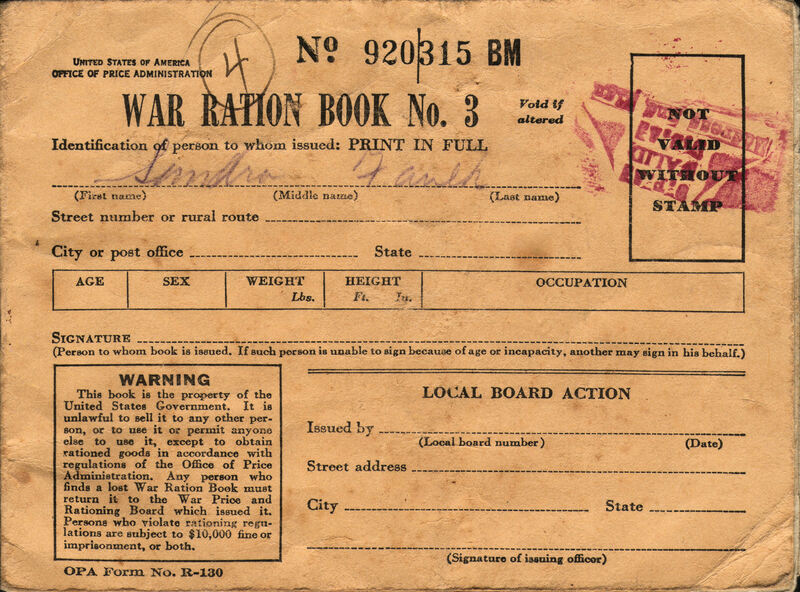 Any person who finds a lost War Ration Book must return it to the War Price and Rationing Board which issued it. Persons who violate rationing regulations are subject to $10,000 fine imprisonment, or both. 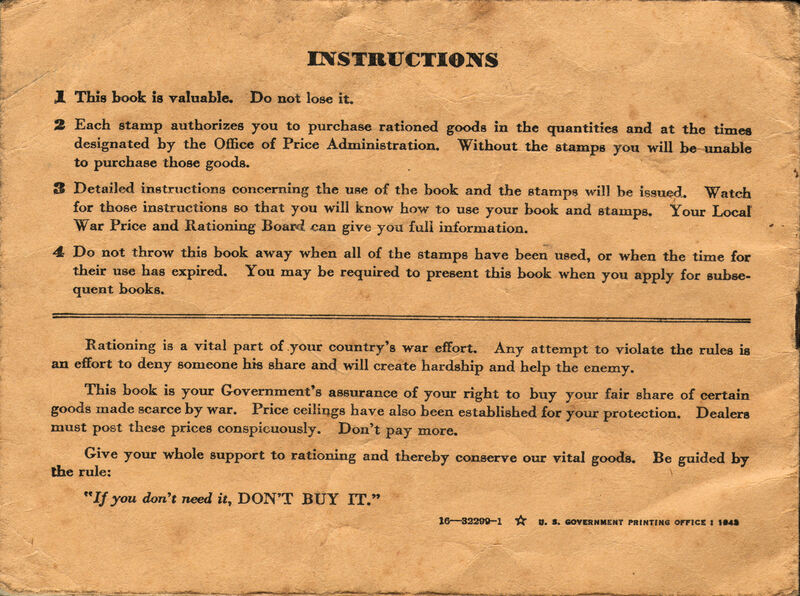 This book is your Government's assurance of your right to buy your fair share of certain goods made scarce by war. Price ceilings have also been established for your protection. Dealers must post these prices conspicuously. Don't pay more. Give your whole support to rationing and thereby conserve our vital goods. Be guided by the rule: "If you don't need it, DON'T BUY IT." The aim of price control is to decree prices, wages, and interest rates different from those fixed by the market. Let us first consider the case of maximum prices, where the government tries to enforce prices lower than the market prices. The prices set on the unhampered market correspond to an equilibrium of demand and supply. Everybody who is ready to pay the market price can buy as much as he wants to buy. Everybody who is ready to sell at the market price can sell as much as he wants to sell. If the government, without a corresponding increase in the quantity of goods available for sale, decrees that buying and selling must be done at a lower price, and thus makes it illegal either to ask or to pay the potential market price, then this equilibrium can no longer prevail. With unchanged supply there are now more potential buyers on the market, namely, those who could not afford the higher market price but are prepared to buy at the lower official rate. There are now potential buyers who cannot buy, although they are ready to pay the price fixed by the government or even a higher price. The price is no longer the means of segregating those potential buyers who may buy from those who may not. A different principle of selection has come into operation. Those who come first can buy; others are too late in the field. The visible outcome of this state of things is the sight of housewives and children standing in long lines before the groceries, a spectacle familiar to everybody who has visited Europe in this age of price control. If the government does not want only those to buy who come first (or who are personal friends of the salesman), while others go home empty-handed, it must regulate the distribution of the stocks available. It has to introduce some kind of rationing. But price ceilings not only fail to increase the supply, they reduce it. Thus they do not attain the ends which the authorities wish. On the contrary, they result in a state of things which from the point of view of the government and of public opinion is even less desirable than the previous state which they had intended to alter. If the government wants to make it possible for the poor to give their children more milk, it has to buy the milk at the market price and sell it to these poor parents with a loss, at a cheaper rate. The loss may be covered by taxation. But if the government simply fixes the price of milk at a lower rate than the market, the result will be the contrary of what it wants. The marginal producers, those with the highest costs, will, in order to avoid losses, go out of the business of producing and selling milk. They will use their cows and their skill for other, more profitable purposes. They will, for example, produce cheese, butter, or meat. There will be less milk available for the consumers, not more. Then the government has to choose between two alternatives: either to refrain from any endeavors to control the price of milk and to abrogate its decree, or to add to its first measure a second one. In the latter case it must fix the prices of the factors of production necessary for the production of milk at such a rate that the marginal producers will no longer suffer losses and will abstain from restricting the output. But then the same problem repeats itself on a remoter plane. The supply of the factors of production necessary for the production of milk drops, and again the government is back where it started, facing failure in its interference. If it keeps stubbornly on, pushing forward its schemes, it has to go still further. It has to fix the prices of the factors of production necessary for the production of those factors of production which are needed for the production of milk. Thus the government is forced to go further and further, fixing the prices of all consumer goods and of all factors of production—both human (i.e., labor) and material—and to force every entrepreneur and every worker to continue work at these prices and wages. No branch of industry can be omitted from this all-round fixing of prices and wages and from this general order to produce those quantities which the government wants to see produced. If some branches were to be left free, the result would be a shifting of capital and labor to them and a corresponding fall of the supply of goods whose prices the government has fixed. However, it is precisely these goods which the government considers especially important for the satisfaction of the needs of the masses. But when this state of all-round control of business is achieved, the market economy has been replaced by the German pattern of socialist planning. The government’s board of production management now exclusively controls all business activities and decides how the means of production—men and material resources—must be used. The image on the left is part of the collection of war posters from the Boston Public Library, Print Department <http://www.flickr.com/photos/boston_public_library/>. 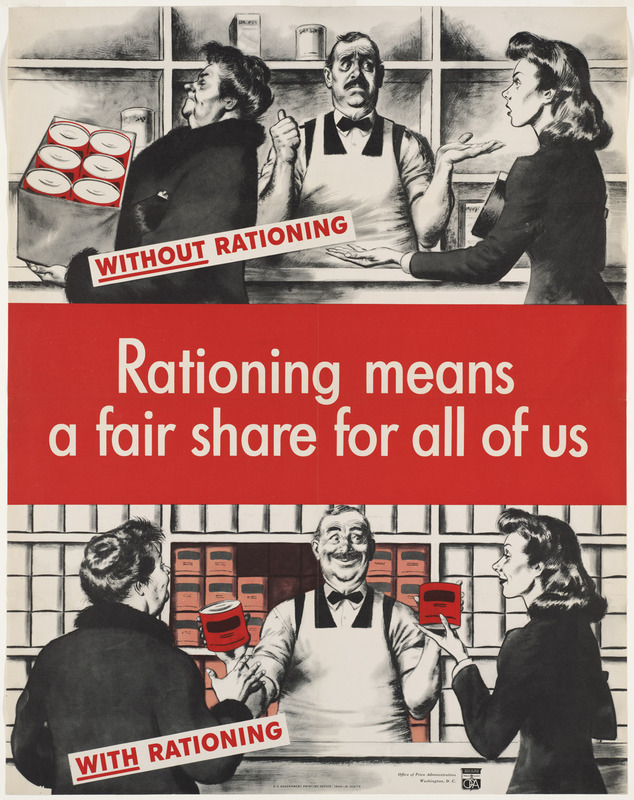 It was entitled "Rationing means a fair share for all of us" and was drawn by Herbert Roese in 1943 for the Office of Price Administration. The library describes it as follows "Two pictures illustrate the outcome of a trip to the grocer with and without rationing. The top picture, captioned "without rationing," shows a woman leaving with a case of canned goods and while an apologetic grocer gestures towards his empty shelves in response to a second woman's request. The lower picture, captioned "with rationing," shows the grocer standing in front of well-stocked shelves and handing each woman a single can." The image on the right is entitled "America needs your scrap rubber" and was produced by the War Production Board in 1942. Natural rubber was sourced in only a few overseas locations (such as Malaya which in 1942 was occupied by Japan) and was in short supply. Nazi Germany had realised the importance of gasoline and rubber to any future war effort and had taken steps in 1936 in its "Four Year Plan" to begin producing artificial rubber and gasoline. The United States was forced to severely ration rubber by banning production for civilian uses (such as tires for automobiles) and urging citizens to recycle. 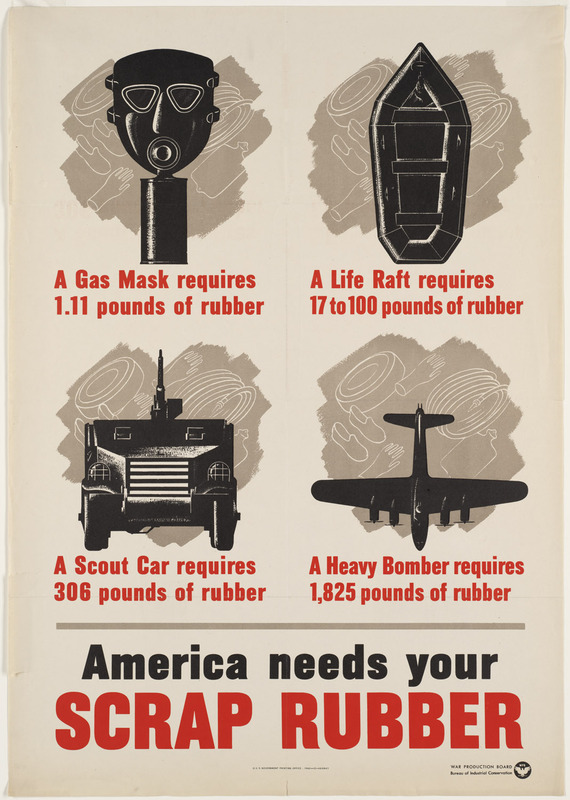 The captions in the poster tell people how much rubber is needed to produce 4 key war products: "(1) "A Gas Mask requires 1.11 pounds of rubber," (2) "A Life Raft requires 17 to 100 pounds of rubber," (3) "A Scout Car requires 306 pounds of rubber," (4) "A Heavy Bomber requires 1,825 pounds of rubber." The image on the left is another war poster from the collection in the Boston Public Library. 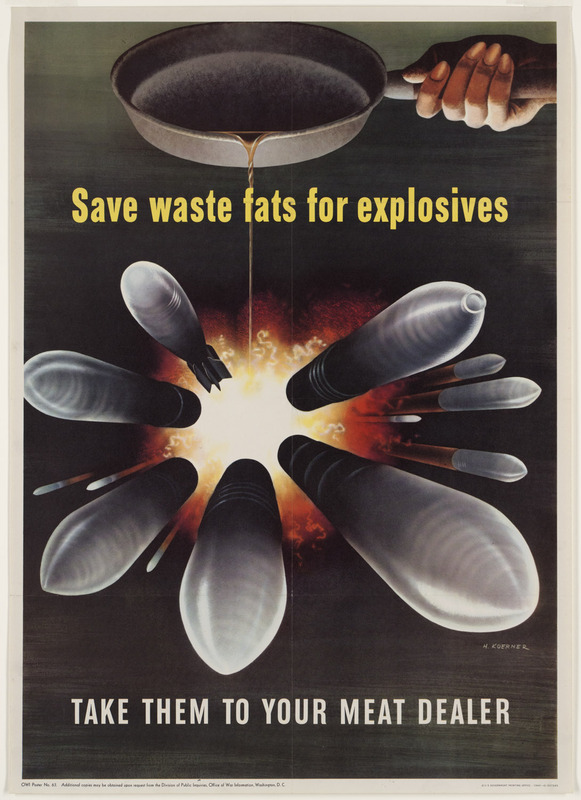 It is entitled "Save waste fats for explosives. Take them to your meat dealer" and was drawn by Henry Koerner in 1943 for the Office of War Information. The image on the right attempts to make the individual consumer of gasoline feel guilty for driving alone in his car at a time when gasoline was much needed for military purposes. Along with natural rubber, gasoline was in very short supply for use in military vehicles and aircraft. 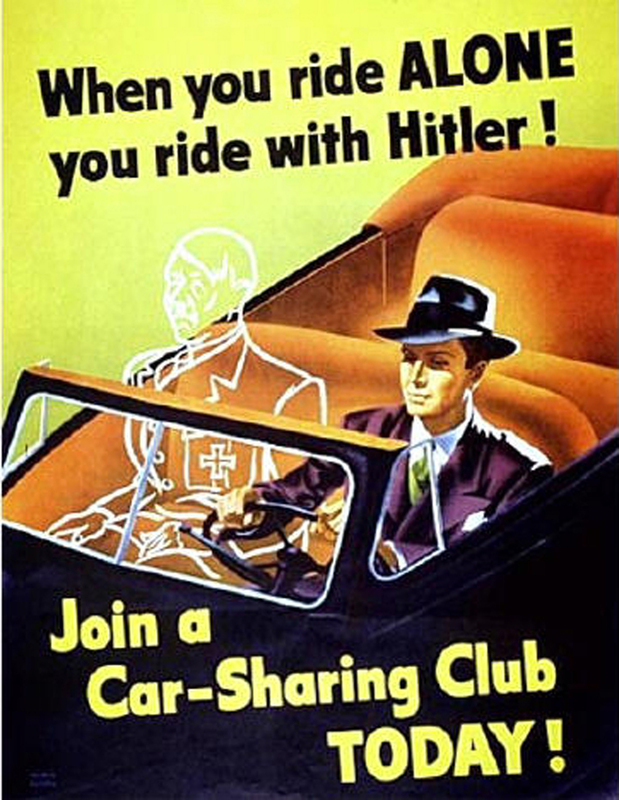 The poster urges the consumer to "Join a Car-Sharing Club TODAY!" 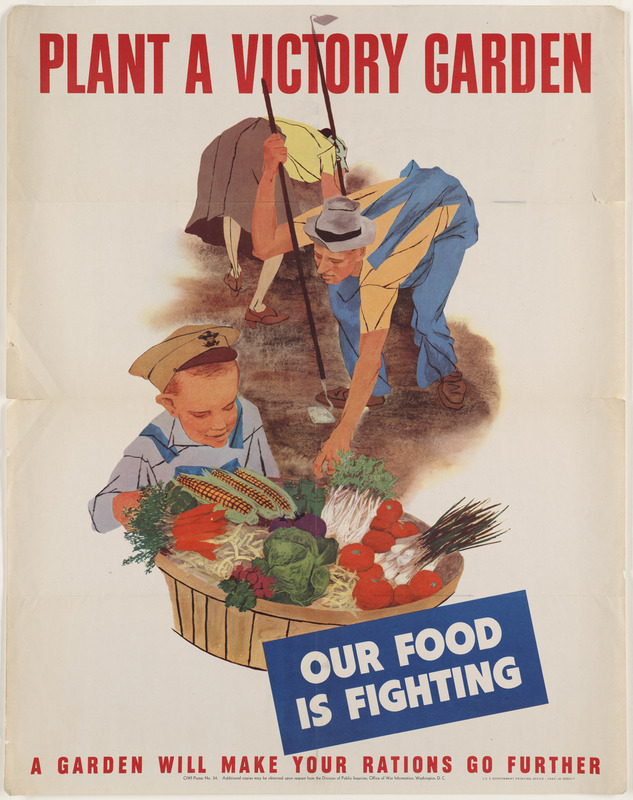 The image on the left was produced by the Office of War Information in 1943 and is entitled "Plant a victory garden. Our food is fighting". The description states "Color drawing of man, woman, and child gardening with full baskets of vegetables. The boy is in the foreground behind basket of vegetables; the man and woman are in the background holding hoes and bending over the soil. Caption below image reads "A garden will make your rations go further."" The image on the right was drawn by Courtney Allen and is called "The sky's the limit! 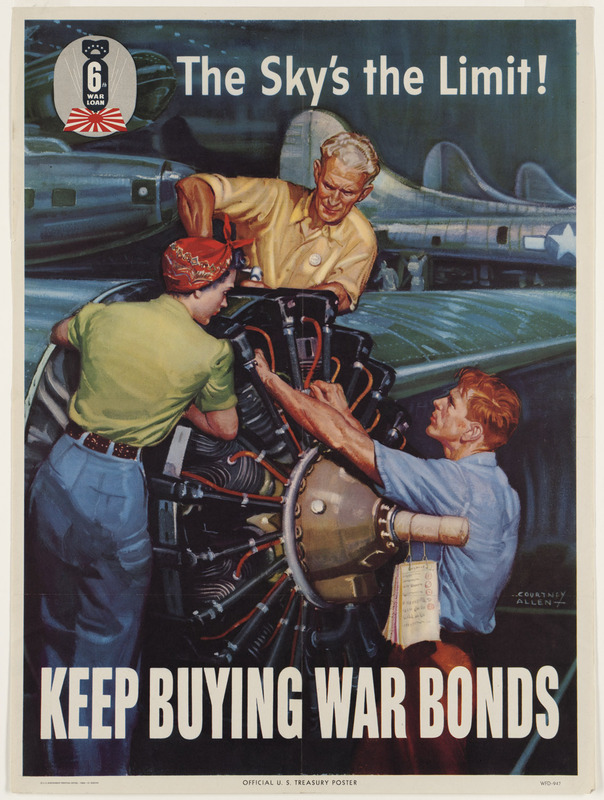 Keep buying war bonds". It was commissioned by the United States Department of the Treasury in 1944. The description states "Two men and a woman working on American military airplane engine, with other airplanes in background. In the upper left hand corner is a bomb logo with the words "6th war loan"" with the bomb hanging over a flag of the Empire of Japan. One of the more common propaganda posters in WW1, for all sides, were for war loans. Given the more sophisticated and expensive weaponry used in WW2 and the larger numbers of men under arms, paying for the war was a massive undertaking and it resulted in a very large increase in the size of government expenditure and the national debt. The image on the left is by George Roepp and is entitled "I've found the job where I fit best! Find your war job in industry, agriculture, business" and was drawn for the Office of War Information in 1943. 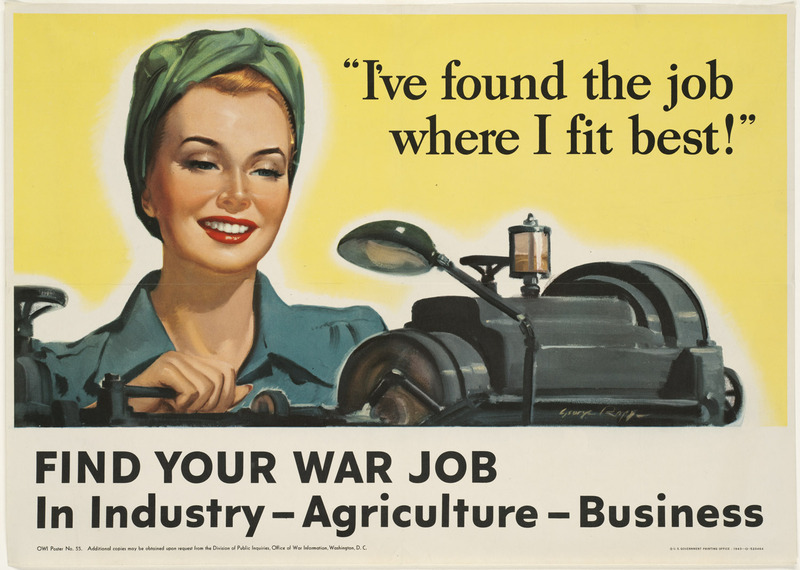 The description states "Poster showing head and shoulders of woman operating machinery as part of World War II production effort" One of the major changes introduced into American society in WW2 was the replacement of men in many walks of life who had been conscripted into the army (some 9 million by the end of the war). Their places were taken in many cases by women who entered the workforce to undertake these occupations for the first time. The image on the right is by Adolph Treidler and is entitled "Here's a war job for you!". 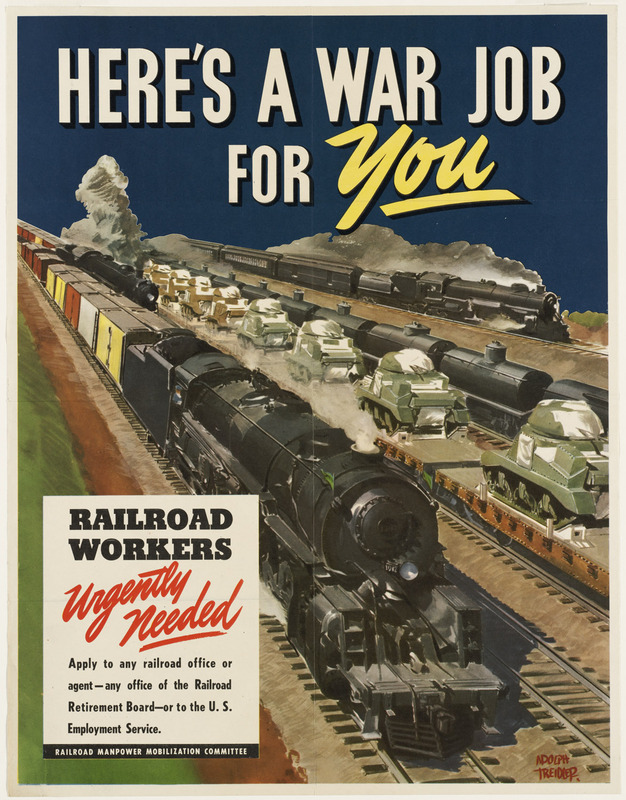 It was produced in 1944 for the Railroad Manpower Mobilization Committee and is part of the collection at the Boston Public Library. The description states "Busy railroad yard showing trains on five tracks. Caption below image reads "Railroad workers urgently needed. Apply to any railroad office or agent -- any office of the Railroad Retirement Board -- or to the U.S. Employment Service." Rail transportation was recognized as vital to the war effort early as the First World War when the American government nationalized the railroads. They were returned to private ownership shortly after the war. They were not re-nationionalized in WW2 but were highly regulated.